Click on the area of the screenshot you have questions about! You will not be able to adjust anything that appears in Green lettering on this screen. There are 11 different types of transactions to choose from. 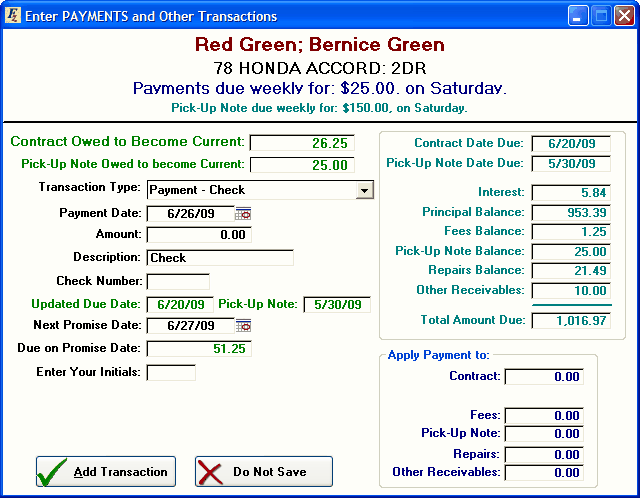 You must select your transaction type before you enter the payment amount. 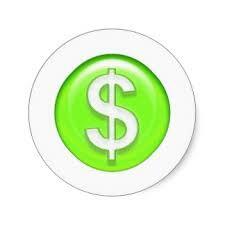 Enter a Forgive Payment to Credit the Customers account, but not show that any money was received by the dealership. 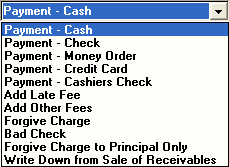 When you enter a bad check the bad check amount will be reversed automatically as long as the original check number was entered in the system. You will need to add the bad check fee in a separate transaction. You may either type in the date or click to bring up a calendar to help you select the correct payment date. You may backdate payments up to 999 days. Top of Page. You may enter a description, or use the description that automatically comes from the transaction type. Top of Page. Initials are required in order to save a sale. If each user has their own login and password, that information will be sued . Top of Page. Once you have entered the amount of the payment, you may choose which part(s) of the balance to apply the payment towards. Two system options can affect this area: one requires the fee balance to be first in line for payment money, while the other requires the contract balance to be paid off before applying money towards the fee balance. Unchecking both options removes all restrictions. Top of Page.